Allah (S.W.T) has legislated different forms of worship so that we do not continuously perform only one which would lead us to get tired of it, and as a consequence, halt performing that kind of worship. Allah (S.W.T) made certain forms of worship obligatory that we may not fall short of performing. He (S.W.T) also prescribed the recommended acts of worship that would increase the rewards. In a Qudsi hadith reported by Imam Bukhari, The Prophet (saws) said: "Allah (S.W.T.) said:' My servant draws not near to Me with any thing more loved by Me than the religious duties I have enjoined upon him, and My servant continues to draw near to Me with supererogatory works so that I shall love him. When I love him I am his hearing with which he hears, his seeing, with which he sees his hand with which he strikes and his foot with which he walks. Were he to ask [something] of Me, I would surely give it to him, and were he to ask Me for refuge, I would surely grant him it." The prayer is one of these forms. Allah (S.W.T) prescribed upon us five in a day and a night. Five to perform, and fifty in rewards in the scale on the Day of Judgment. Allah (S.W.T) recommended us to increase our non-obligatory prayers so that they can make up for the less perfect obligatory prayer. In an authentic hadith reported by Imam At-Tirmithi, Abu-Dawud, An-Nisai and others that the Prophet Muhammad said: "The first of his actions for which a servant of Allah will be held accountable on The Day Resurrection will be his prayers. If they are in order, then he will have prospered and succeeded; and if they are wanting, then he will have failed and lost. If there is something defective in his obligatory prayers, the Lord (S.W.T) will say: see if my servant has any voluntarily prayers with which may complete that which was defective in his obligatory prayers. Then the rest of his religious duties will be judged in like fashion." From the recommended prayers that accompany the obligatory ones are: the two Rakahs before Fajr, four before Thuhr, two after it, two after Al-Maghrib, and two after Alisha. And from the recommended ones are special ones that are greatest after the obligatory prayers. This is the night prayer. Imam Muslim reported that the prophet (saws) said: "The best prayer after the obligatory is the night prayer." From the night prayer is the Witr prayer which is an emphatic Sunnah according to the opinion of the major scholars and obligatory according to Imam Abu Hanifah. The least Witr prayer is one Rakah and eleven Rakah is the most it can get. All this is evidenced from the sayings and actions of the prophet (saws). The night prayer in Ramadan has a special consideration different from any other time of the year. Imams Bukhari and Muslim reported that the Prophet Muhammad (saws) said: "Whoever offers optional prayers (like Taraweeh prayers) throughout the nights of Ramadan, believing in Allah and seeking His rewards, will have his previous sins forgiven." Qi-yam of the nights of Ramadan includes the early as well as the late night. So, the Taraweeh is considered from the Qi-yam of Ramadan so we should perform it. It was called Taraweeh because the Companions of the prophet and the successors to the Companions used to make a lengthy standing in them and they would take rest after offering every four Rak'ah. This is how these came to be named Taraweeh (Rest prayer). (Four Rak'ah are called Tarweehah). The prophet (saws) was the first who made praying the Taraweeh in congregation Sunnah (recommended), and then he left it fearing that it may become obligatory upon his Ummah. 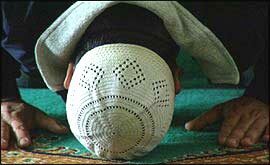 Imams Bukhari and Muslim have reported that Aeeshah (R.A.) said that the prophet (saws) prayed once in the Masjid in one of the night of Ramadan. People joined him, and then more people joined him in the next night. Then more people waited for the prophet (saws) in the third and the fourth (night), but the prophet (saws) did not come out to them. In the next morning, the prophet (saws) said: "I have seen what you did, nothing had prevented me from coming out to you except that I feared that it may become obligatory upon you." Then, during the rule of Umar Ibn Al-Hkattab (R.A.), he saw the companions praying in the Masjid individually, or in different congregation so he ordered them to prayer behind one Imam. During his caliphate, In an authentic narration reported by Imam Malik "Umar (R.A.) ordered Ubayy bin K'ab and Tamim Ad-Dari (R.A.) to offer them in congregation. He enjoined them to offer eight Rak'ah Tarawih and three Rak'ah witr. This practice has been going on ever since." The scholars have different opinions about the number of Rakahs of Taraweeh prayer along with the Witr. Some said: forty-one Rakahs, some said: thirty-nine, some said: twenty-nine, some said: twenty-three, some said: nineteen, some said: thirteen, and some said: eleven. The strongest opinions are those who said: eleven according to Imams Bukhari and Muslim that Aeeshah (R.A.) was asked about the night prayer of the prophet (saws) in Ramadan, she replied: "He did not pray it more than eleven Rakahs." Also Imam Bukhari reported that Aeeshah (R.A.) said: "The prophet used to offer thirteen Ruk'at of the night prayer and that included the Witr and two Ruk' at Sunnah of the Fajir prayer." Also Imam Bukhari reported that Ibn' Abbas (R.A.) said: "The Salat (prayer) of the prophet used to be of thirteen Rak'at, i.e. of the night prayer". Which included the Witr and two Ruk'at Sunnah of the fajir prayer. The early Muslims from the used to pray the Taraweeh prayer. Assaeeb bin Yazeed said: "The Imam used to read hundreds of verses and we used to use the staff to help us stand up from the lengthy standing." This is contrary to what many Muslim do these days. The people today pray the Taraweeh with great speed so that the recitation is almost not understood. So we should be really cautious. Since Ramadan is coming soon, we should prepare ourselves for it. We should prepare ourselves to pray the Taraweeh in the Masjid in congregation with the Imam and not to leave until the Imam has finished it and finished the Witr prayer so that we all gain the rewards of praying the whole night. The prophet (saws) said: "Whoever prays with the Imam until he leaves, it is considered as Qi-yam of one night." The scholars have a consensus that women are allowed to come to pray the Taraweeh in the Masjid with men if they are wearing the Hijab, and men should not prevent the women from coming to the Masjid. Imams Bukhari and Muslim reported that the Prophet Muhammad (saws) said: "Do not prevent women from coming to the Massajid." It is a must that women should have a designated place in the Masjid in the back of it like it was during the life of the prophet (saws) and that they start with the last row unlike men. Imam Muslim reported that the Prophet Muhammad (saws) said: "The best of the men's rows [In salat (prayer)] is the first row and the worst row is the last; but the best of the women's row is the last row and the worst of their rows is the first." For those women who come to the Masjid for the congregation prayer, they should leave the Masjid as soon as the Imam makes Tasleem, or they should have special doors for them to leave the Masjid from so that they would not mingle with men. Imam Bukhari reported that Umu Salamah (R.A.) said: "When the prophet (saws) used to make Tasleem, the women got up and left while the prophet (saws) remained shortly in his place before he got up. She said: this is (Allah knows best) because the prophet (saws) wanted the women to leave before the men can catch up with them."